Amidst the world-round hype created over the release of Apple's iphone 4 on 24th june, there's an official news coming from the Motorola's arena for the release of two new devices – Droid X and Droid 2 just one day before the release of iphone 4 i.e. on 23rd june. These two handsets would run under Google's Android operating system. Motorola has joined hands with the Mobile phone carrier Verizon Wireless for the release of the devices. Some details for the devices are now available, courtesy leaked commercial slides and scripts. Droid X seems to be the Motorola's answer to the HTC EVO 4G in terms of hardware as it is dimensionally larger than the latter. 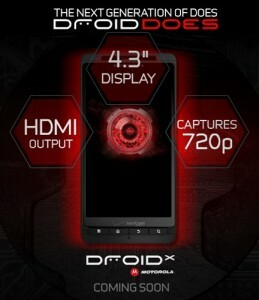 It carries of a 4.3-inch, FWVGA 854 x 480-resolution screen but there have been conflicting reports on the Droid X's screen size. 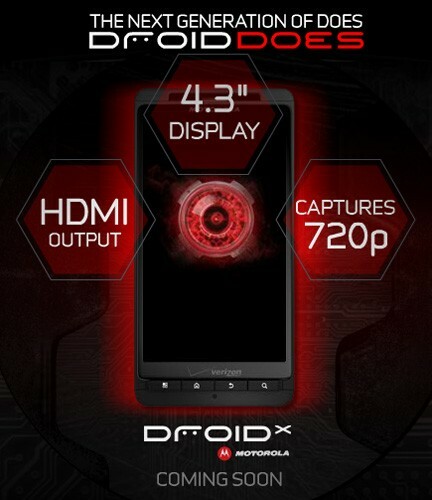 The Droid X has a 8-megapixel camera, and records 720p video. The mobile device is said to run Android 2.1 operating system. And the screen and user interface are both considered to be excellent and very responsive. 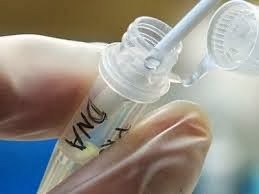 There are also rumors for the device to challenge the iphone 4's Retina Display. As for the Motorola Droid 2,there's still no official word. The leaks say that it boasts about its 1GHz processor and 8GB of internal memory. The device is curvier than the original and almost exactly the same size, with a slightly wider keyboard(QWERTY) layout and a physical button for voice search input. At this time, the Motorola Droid 2 runs Android 2.1 with "Ninjablur" (like the Droid X), however, it seems the handset might land on the market with Android 2.2 Froyo on board, but there's no confirmation on this.